A samurai who loses his master or is sent away from his master's charge is obligated, by the Bushido code, to commit seppuku – to end his life. 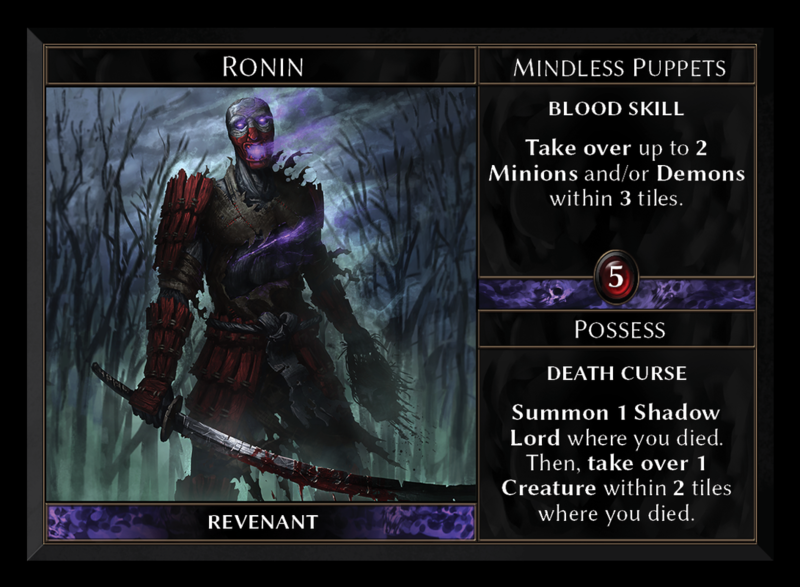 Those who refuse this path are dubbed Ronin and suffer great shame. A young samurai appeared at the door of an inn, dripping from the freezing rain. His face and hands were covered in splatters of blood. As the young samurai entered the inn, he collapsed before the innkeeper who took him upstairs, cleaned him, clothed him and fed him. When the innkeeper discovered the young samurai had no visible cuts on his person she did not speak out, though her suspicion was piqued. She nursed the young samurai for seven days and nights, his recovery slow and painful. He screamed in the night and slept fitfully in the day, sweating and shaking all the while. Though his screaming drove travelers and customers away, the innkeeper watched over him dutifully. She tried to speak with him but he seemed beyond consciousness, unable to process the reality before him, wrapped, instead, in the apparently cruel and twisted world of his delusions. When one week had passed, his eyes shot open in the night. The innkeeper was startled by the color and intensity of what she saw. His fiercely bloodshot eyes were discolored and graying, the iris the color of deepest purple, the pupils as small as the tip of a needle. The innkeeper was drawn in by the depth of those eyes, shown small portions of the young samurai's life. She sees a young boy, a large gash crossing his chest, slogging through the mud as rain pours heavily upon him. Slowly the young boy drags himself to the door of a dojo, collapsing in the doorway. She sees a young man, a deep scar on his chest, training with a katana, slowly mastering the art under the tutelage of an honorable samurai. The young man is frustrated, his limbs heavy with the fatigue of strict guidance. She sees a young samurai stumbling upon a mana pool. He submerges himself in the blue fountain, unaware of the malevolent spirits that frequently accompany the ponds where the essence of magic is collected. Pain wracks her brain as she sees the young man struggling with a malicious spirit, fighting to retain his humanity in the face of pure, nefarious evil. The spirit forces itself to the forefront of his consciousness, consuming his mind, controlling his body. 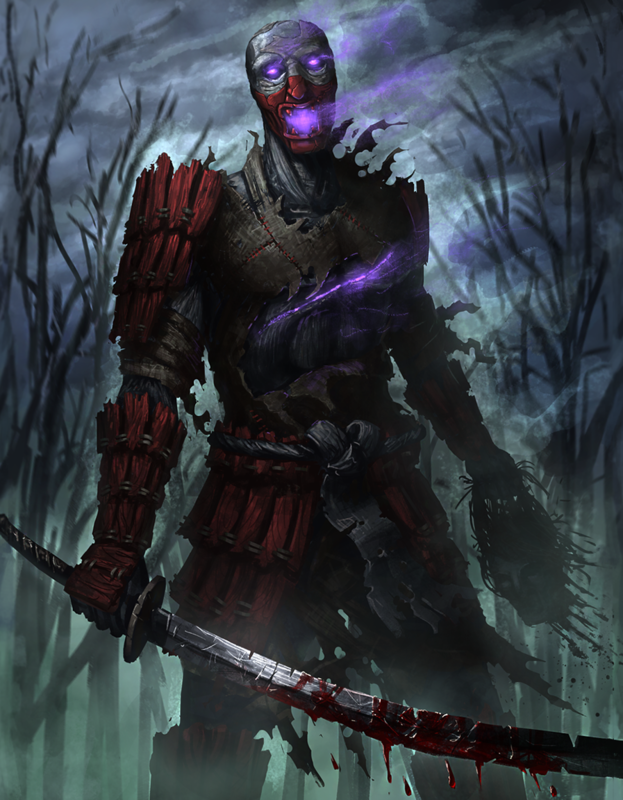 She sees the young samurai, his eyes bloodshot and deep, glowing purple. He slowly makes his way into the dojo that saved the young boy's life so long ago. She sees him crouched over the benevolent samurai who had taken the young boy in when he was a mere step away from death. The older master's eyes bulge from his head and he struggles with the pallid hands wrapped around his throat with inhuman strength. When the samurai's struggle ceases, the pallid hands rise up above the young man's head, a dull knife made of bone clasped within. She sees the blood of the older samurai painted on the wall of the dojo, a star within a circle, the final step of the malevolent spirit's possession. The spirit of the young man flows from his body and is drawn through the symbol on the dojo's wall. She hears a faint, subdued scream as his spirit falls deeper, ever deeper, into nothingness. Finally the pain ceased. She was released from this vision. She fought to catch her breath and shut her eyes to the residual heaviness she felt in her head. Her eyes opened and she saw the flash of a sword.